So, I checked out two local fall plant sales last weekend. 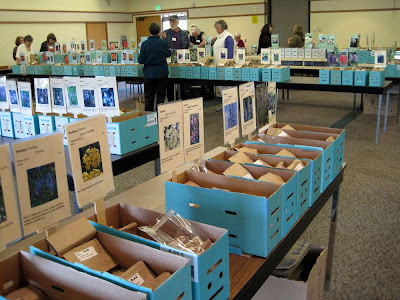 On Saturday, I headed over to Magnuson Park (well known for sponsoring those immense Seattle Public Library book sales) and sought out the Native Bulb, Seed and Plant Sale, sponsored by the Washington Native Plant Society. The sale only filled one of the smaller parts of the main hangar and was a bit underwhelming. There was a bunch of shrubs and trees, one table with a decent collection of books, and another table with seeds. Interestingly, there seemed to be just as many orange vest volunteers on-site as there were actually customers. On Sunday, I drove over to the Center for Urban Horticulture (near the UW playfields) and checked out the Hardy Plant Society of Washington's first annual Fall Bulb Sale. 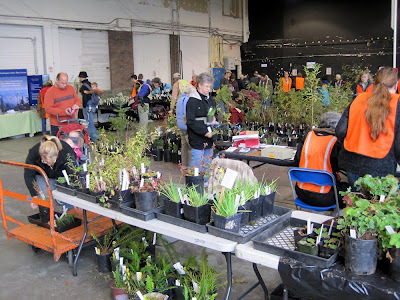 They had one row of tables outside with live plants, while the entirety of the inside area comprised dozens of boxes of bulbs and seeds. 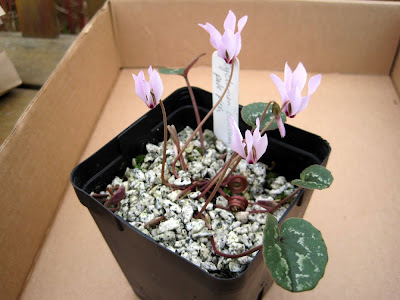 I ended up snagging a particularly attractive Cyclamen Cilicium, as well as a unique looking Cilla bulb, and some tulip bulbs.